Asics Gel Noosa Tri 9 are neutral performance running shoes. 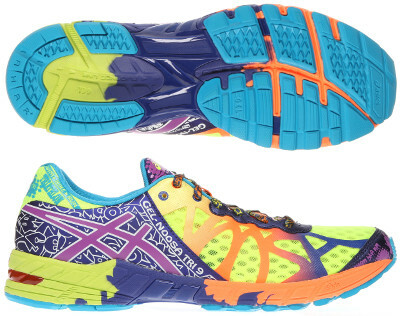 The Asics Gel Noosa Tri 9 is without doubt the most striking running shoe in the market. Really popular not only among triathletes but also trendy runners and based on beloved Gel DS Trainer 19, the Noosa Tri 9 features great performance with its phenomenal blend of cushioning and responsiveness combined with pronation control. As mentioned above, the Noosa Tri 9 shares many things with Gel DS Trainer 19: midsole is mainly made of Solyte with well known Gel® in both heel and forefoot for shock absorption and Dynamic Duomax to provide pronation control. Plastic shank features extra support and divides outsole in two areas: rearfoot with durable AHAR+ and forefoot with blown rubber for more grip and comfort. Major change from its predecessor Gel Noosa Tri 8 takes place in the upper with new lightweight microperforated mesh at front side for improved breathability and a plastic and more rigid one at the rear side. It is perfectly possible to wear the Noosa Tri 9 without socks thanks to seamless interior which avoids friction.